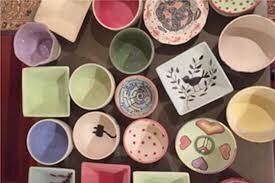 Come for a fun night with friends and family for our first ever pottery painting party. Choose between mugs, bowls and planters. A fun night of painting on pottery that will then be fired and you can pick up the following week to take home. All supplies are provided. A kid friendly event. So much fun. We are excited to offer this at the shop. $25/person Must have prepayment by April 12th to ensure your spot. Limited space so sign up today.